Our show is this weekend, so I only have one thing to say. Come!! And then pull up your pants, get on the 38, walk a few shady blocks and you're there! Parent's Truth: Nico and my parents (that's separate parents, despite the similarities we're not related) are coming to the show. This will be interesting for many reasons. Reason 2: Although Chinese Ballroom prides itself on staying away from raunchy material, if Reason 1 becomes Problem 1, my dad may be throwing out some questionable suggestions. Reason 3: Spotlight. Nico and I enjoy our time in the limelight, and I swear to God if our parents upstage us, say, during Dummies, I will smash a wine bottle! Phoenix Truth: With Ruby Sky next store and Comedy College upstairs, our show has the douche built in. 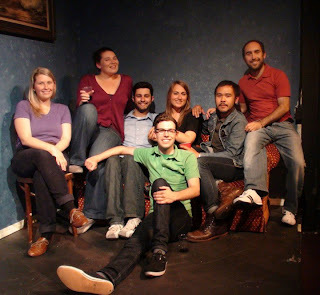 Meghann's Truth: I will miss improv so much in Spain, I may try to do some games there. Only problem is I don't speak Spanish, so I'm gonna have to get realllly good at miming. Maybe I'll attempt some at the show. Ballas truth: Our trusty crew of fans have been with us for almost two years now, and there is always room for more!! See ya'll at Phoenix Theatre Annex (4th floor), 414 Mason St.